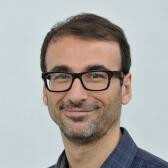 Dr. Kilicoglu has expertise in biomedical natural language processing and text mining; more specifically, his research focuses on semantic interpretation of biomedical text, question answering, and literature-based knowledge discovery. He currently contributes to the LHNCBC’s Consumer Health Question Answering (CHQA) and Semantic Knowledge Representation (SKR) projects. He earned his PhD in Computer Science from Concordia University in 2012, his MS in Computer Science from George Washington University in 2000, and his BS in Computer Engineering from Istanbul Technical University in 1997.